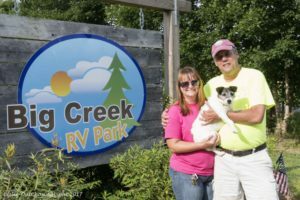 The owners of Big Creek RV Park,…. and Roxy, Greeter! 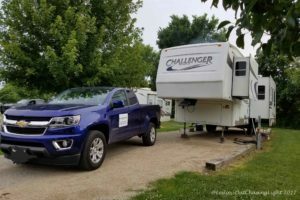 I spent the last week of June in the Arcadia Valley of MO this year, on a photographic assignment, and I returned each night to my peaceful campsite at Big Creek RV Park. Camping at Big Creek RV Park is a relaxing experience, because of it’s quiet family oriented atmosphere. 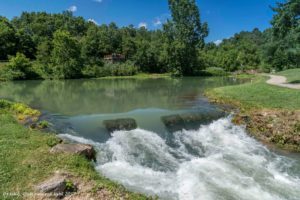 The campground sits along the banks of 3 inch deep, spring fed Big Creek, which is inviting to wade into on a hot summer’s day. There’s nothing like the sound of a calm, harmonious babbling creek! 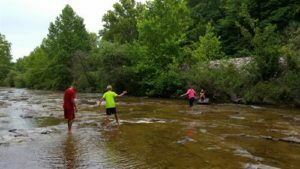 Big Creek, its just a few inches deep, but offers refreshing adventures! 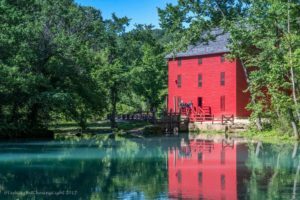 The staff are friendly, welcoming, and work diligently to keep the grounds in tip top shape. There is a pool that is conveniently situated in the center of the park, and sits directly behind the activities building. The individual private bathroom and shower suites are also located in the activities building with outside access. I was really impressed with the cleanliness of the facilities. It’s obvious that the owners care about their guest’s experiences while staying at their park. 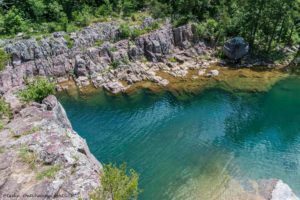 Big Creek RV Park is in a great location, and is fairly close to the Ozark’s Johnson Shut-Ins, Elephant Rocks, and the Black River, which offers the opportunities for float trips. 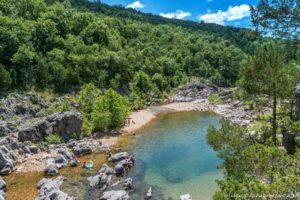 Also within an hours distance are Rocky Falls (another shut-ins area), the Current River, Alley Springs, and many more Ozark Valley adventures. 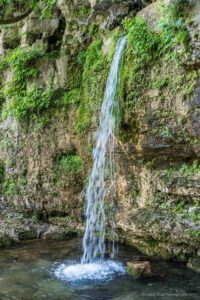 If you’re heading to the Ozark’s and are looking for a great campground to spend some time at with a family atmosphere, I highly recommend Big Springs RV Park! If you think of it, give Roxy a scruff behind her ears, and tell Patty that Leslie @ Out Chasing Light says “Hi”!